The U3 unemployment rate fell to 5.9% in September, the lowest it has been since July ’08. Job openings are at cyclical highs. Layoffs and discharges are at cyclical lows. Jobless claims are consistent with a much lower unemployment rate. The Establishment Survey (job creation) is as strong as it was in the last boom (’03-’07). While the market appears disappointed with housing (August’s existing home sales down and housing prices are flat MOM), new home sales are up significantly. Distressed home sales fell to 8% in August from 12% a year earlier. The all cash investors are leaving the market. Thus, even a flat market means that normal buyers are taking up the slack left by investors’ exit. First-time home buyers are still an issue at 29% of purchase contracts. In the past, normal was 33%. Growing jobs in the 25-34 age cohort is a positive for future sales. A new study indicates that the Millennials have similar aspirations to own houses as older generations, but have been delayed by the Recession and because they are marrying and having children later. Industrial Production continues to rise; the flat line in August was likely due to cooler than normal weather causing lower utility output. 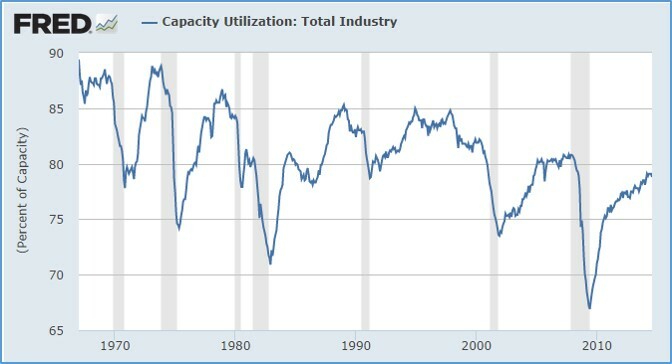 Capacity utilization is approaching its practical ceiling. It is still not at the level of prior peaks (see chart), but rapid technological advancement implies earlier obsolescence, and we see a pattern of lower peaks in this series. Over 80% utilization rate requires overtime and the employment of older and less efficient assets. There are reports of increasing plans for capital expenditures. In the post-recession period, corporations have hoarded cash, repurchased stock, and pursued M&A, but haven’t bought plant and equipment in anticipation of organic growth. Thus, the poor GDP growth rates we have seen since ’09. The nondefense capital goods and construction spending series shown in the table are still flat to up slightly, so the jury is still out on the cap ex file. Despite media sentiment to the contrary, the consumer is doing okay (not great, but okay). Consumer debt levels are down to 1999 levels (but total debt levels are still at ’07 levels because government has gone on a binge). Consumers now have the capacity to spend and it is showing up in growing credit card debt and the purchase of vehicles (August set a record at 17.9 million unit annual rate). The reduction in gasoline prices is acting like a huge tax cut, with every penny decline in price per gallon worth $1 billion to consumers; most of the gas price relief will end up being spent on other goods and services. The national average price dropped to $3.33/gal, down 10% from its high this year and the lowest September reading since 2010. With crude oil futures falling to the lowest levels since 2012, gas prices are expected to fall to below $3 in coming months. Consumer Confidence has been rising throughout the spring and summer, but fell unexpectedly in September, likely due to geopolitical concerns. U.S. GDP grew a whopping 4.6%, and Q3, just concluded, is likely to show up in the mid-3’s, still quite heady for a mature industrial economy. The unemployment rate is expected to continue to fall and has achieved a “5” handle. 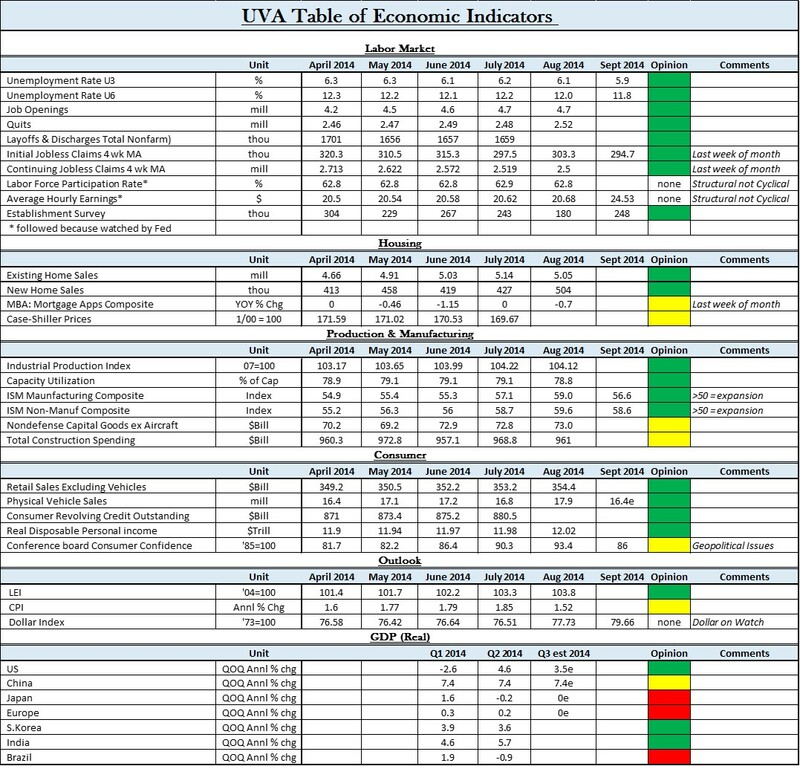 Meanwhile “official” inflation is still way below the Fed’s 2% target (due to falling energy prices)(see table). Gas prices are down because supply is growing while demand is waning. China is slowing but both Europe and Japan are likely recession bound. Brazil and much of So. America are already in recession. That means more money will be printed by the PBOC, the Bank of Japan, the ECB and other central banks. At the same time, with QE ending in the U.S., the dollar is likely to get stronger. Leading economic indicators in Europe dropped sharply in August, for a third straight decline. In the Fed’s official statement following the FOMC meeting in mid-September, there were 5 significant pronouncements: 1) The long-term GDP forecast was lowered (dovish); 2) the language that “there remains significant underutilization of labor resources” was left in (dovish); 3) the statement said that inflation remained below the Fed’s long term objective (dovish); 4) the statement kept the “considerable period” language referring to the amount of time there will be between the end of QE and the first rate rise (dovish); 5) the Summary of Economic Projections, known as the Dot Plot, moved the projected Fed Funds rate higher by the end of 2015 than in earlier Dot Plot projections (hawkish) – the Dot Plot, for example, had the projection for the Fed Funds rate for the end of 2015 at .75% at December’s FOMC meeting, and it rose to 1.000% at the March meeting, 1.125% in June, and was 1.375% at this last meeting. The markets have concentrated on the hawkish nature of the Dot Plot despite the fact that the other pronouncements were dovish. But, the Dot Plot is suspect because the composition of the plotters, themselves, changed significantly since December, and, therefore, the plots over that time period are not comparable. The FOMC composition will also change in 2015 as 4 Fed Bank Presidents roll off the FOMC and 4 new ones roll on. Of the roll-offs, 2 are doves and 2 are hawks. The roll-on composition is 3 doves and 1 hawk. So, given the dovish nature of the statement and the changing composition of the FOMC itself, it is likely that the Fed will stay easy longer than the market anticipates. Furthermore, economic turmoil in Japan and Europe and the slowdown in China likely may also influence the Fed to stay easier for longer. The U.S. and a few other nations (perhaps India, So. Korea, Taiwan, and Indonesia) are the only economies that are consistent or accelerating. The stronger dollar also attracts more money into U.S. markets, so any equity market correction appears to be a buying opportunity, especially since there is no recession in sight. Weak world economies and a strong dollar are quite negative for the precious metals markets. 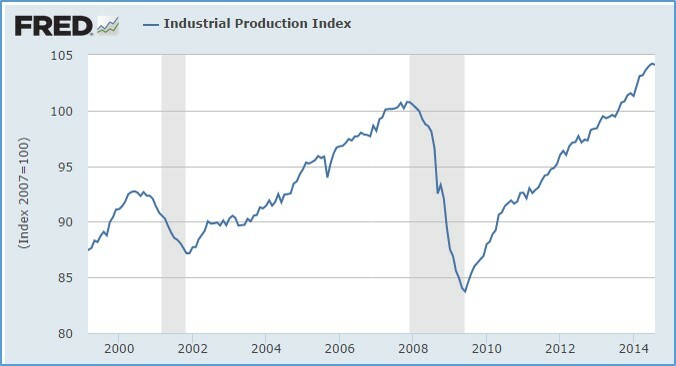 Record high index on industrial production, but the pattern indicates there is still headroom in this cycle. Capacity utilization has not yet reached a level of prior peaks, but we are aware that rapidly advancing technology implies earlier obsolescence which may be causing sequentially lower peaks.